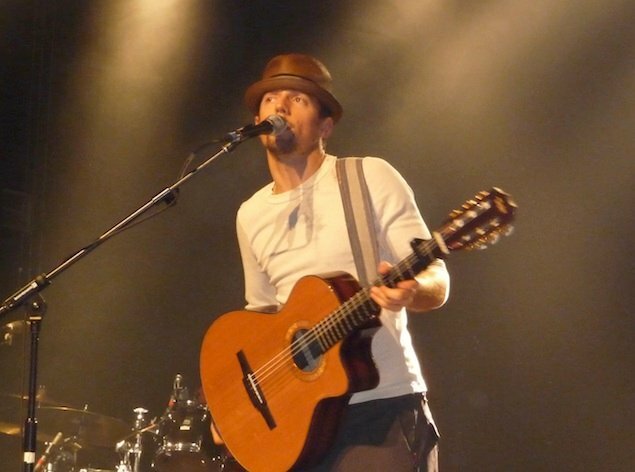 Catch Jason Mraz at Merriweather on Friday, August 24. Photograph by Flickr user Evamaria N.
Pop rock singer and Virginia native Jason Mraz performs at Merriweather Post Pavilion on Friday, August 24. He gained international acclaim with his hit “I’m Yours” in 2008. Tickets ($40 to $60) go on sale Friday, April 13, at 10 AM through Ticketfly. Queen fans rejoice! The official Queen tribute show, Queen Extravaganza , comes to the 9:30 Club on Friday, June 8. The band’s legendary guitarist and drummer, Brian May and Roger Taylor, are behind the show, constructing a touring band of four vocalists and five musicians after intensive 12-week auditions. Tickets ($35) are on sale through Ticketfly. Indie darling Ani DiFranco takes the stage at the 9:30 Club on Saturday, November 10. Since 1990, she has self-produced an astounding 17 studio albums through her own label, Righteous Records. Tickets ($40) are on sale now through Ticketfly. Light Asylum, an electro-disco duo from Brooklyn, play at U Street Music Hall on Saturday, May 5. They are produced by LCD Soundsystem’s James Murphy. Tickets ($12) are on sale through Ticketfly.